The Echuca Court House was erected in Dickson Street in 1873 as a Shire Hall. 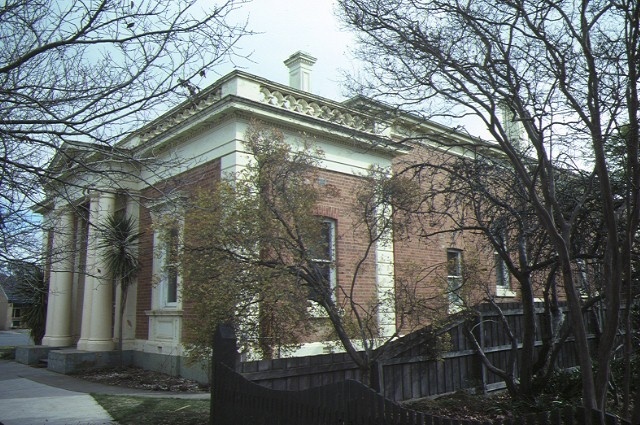 The first timber court house was built in Echuca in 1859 as a Court of Petty Sessions and was located on the south bank of the Murray River. Echuca became a municipality in 1864 and in 1869 a combined town hall and court house was built in High Street and the timber court house was removed to Rochester in 1872. In the years after the construction of the railway line from Melbourne in 1864, the port town of Echuca grew significantly. 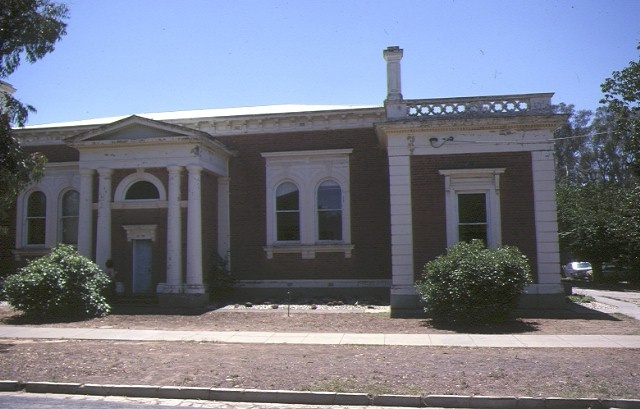 In January 1872 the Echuca Shire Council took possession of land in Dickson Street and Bendigo architects Vahland and Getzchmann drew up plans for a new Shire Hall. Construction of this building was completed by November 1873. In 1877 the administrative offices for the Shire of Echuca were moved to Rochester and instructions were given to sell the Shire Hall. At this time it was described as containing a large hall, four commodious offices, stables and a coach house. It was sold at auction to Mackintosh, Luth and Palmer and subsequently used as a corn exchange. In 1882 the Shire Hall was purchased by the Government for conversion into a court house, to be used as the Supreme Court. Included in this conversion were alterations to the Dickson Street entrance porch and the reduction in size of the large central hall to include extra rooms at one end, over which a gallery was erected. The Court of Petty Sessions continued in the High Street municipal building, although attempts were made in 1893 and 1913 to move all Echuca court activity to the Dickson Street building. The combination of court activities at the Supreme Court building finally occurred in 1924, after renovations and repairs had been carried out. 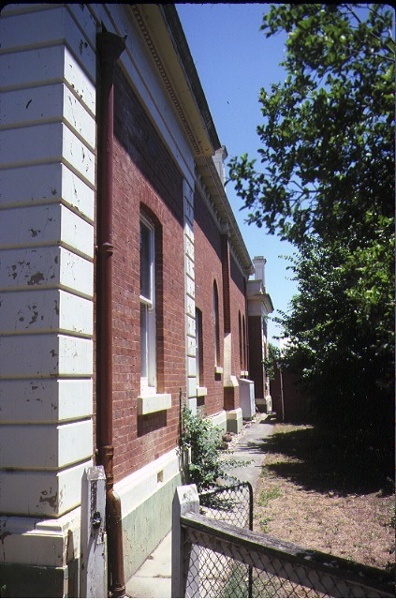 Concerns about the state of the building, largely due to its proximity to the Murray River, were reported constantly, however court sessions were held there until the mid-1980s. The building was reopened in 1988 by the Aboriginal Community of Echuca. The Echuca Court House is a single storey brick building articulated with stucco mouldings. It is symmetrically conceived with ancillary rooms contained in parapeted projecting bays at either end of a hipped roof central hall. The Hopwood gardens entrance facade has a small central Doric portico, flanked by single aedicule windows. The Dickson Street facade comprises a series of three projecting wings, with the Doric portico motif repeated in the central wing. The front and rear wings of the building display a parapet with distinctive circular motif and rusticated corner pilasters. The Echuca Court House is of architectural and historical significance to the State of Victoria. The Echuca Court House is of architectural significance as a fine intact example of a classically designed provincial hall and as an example of the work of prolific Bendigo architects Vahland and Getzchmann. The projecting bays and portico motif of the Dickson Street facade are unusual and combine with the overall use of distinctive decorative mouldings of Doric columns and porticos, rusticated piers, balustrading and window mouldings to create a fine example of nineteenth century conservative classicism. The Echuca Court House is of historical significance for its association with the growth of this important port town which peaked in the 1880s. It is an essential element of the historic Echuca port area and together with the police station (1867), forms a legal precinct. The court house is sited importantly, as it terminates the view from the commercial centre along High Street, and it is a fine feature of this historic city. Court House, Dickson Street, Echuca. 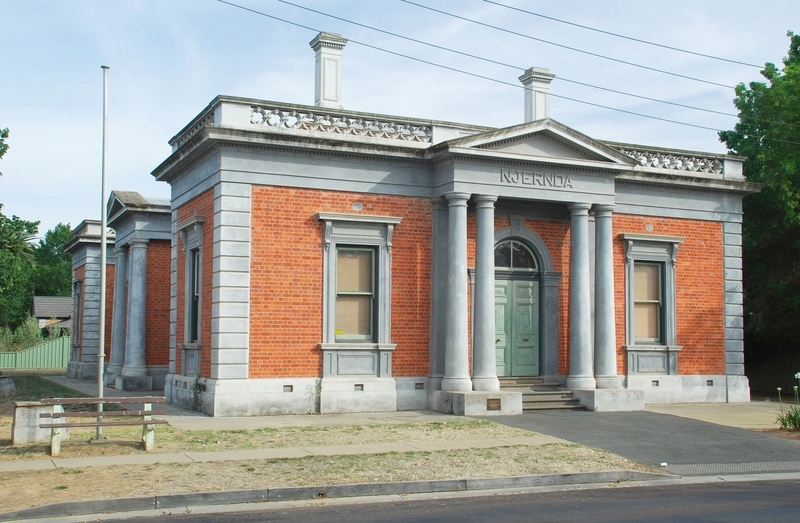 In January 1872 the Echuca Shire Council took possession of land in Dickson Street and Bendigo architects Vahland and Getzshmann drew up plans for a new Shire Hall. Construction of this building was completed by November 1873. In 1877 the administrative offices for the Shire of Echuca were moved to Rochester and instructions were given to sell the Shire Hall. At this time it was described as containing a large hall, four commodious offices, stables and a coach house. It was sold at auction to Mackintosh, Luth and Palmer and subsequently used as a corn exchange.